Cannabis flavonoids produce a range of effects, similar to cannabinoids like THC and CBD, and terpenes like myrcene and limonene. When combined with each other and additional cannabis phytonutrients, they play an important role in both marijuana’s cultivation and consumption. Modern Canna Science is Florida’s preeminent Medical Marijuana Testing Lab. Our professionals work with licensed Medical Marijuana Treatment Centers (MMTC’s) to ensure that medical cannabis and low-THC cannabis products are free from biological and chemical contaminants. Our skilled scientists can also determine cannabinoid profiles for each harvest of raw cannabis flower or the derivative medications created from them. Call us today for quick and reliable cannabis flavonoid testing! When you are admiring the rich red in roses or deep blue in blueberries, thank flavonoids – a group of phytonutrients most known for injecting bright, non-green color pigments to plants, including cannabis. 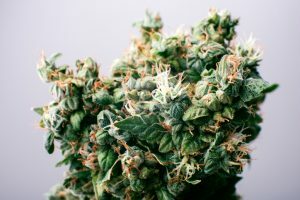 Those same flavonoids contribute many factors to marijuana buds, including color, taste, smell, entourage effect, and overall sensory experience during consumption of the plant. Flavonoids have earned a reputation among members of the wellness community for providing a range of health benefits to humans. The “entourage effect” is a model for explaining why some cannabis strains produce different psychoactive or medicinal effects. CB receptors don’t bind only to THC; rather, they adhere to all of the cannabinoids, terpenes, and flavonoids that are ingested, whether by smoking or eating cannabis. The different ratios of these plant-based compounds trigger different kinds of chemical reactions in the nervous system, which may explain the reason why some cannabis strains provide an uplifting effect and why some strains are more effective for controlling chronic pain. Due to federal prohibition, flavonoids in the cannabis plant have been largely understudied. However, flavonoids are one of the largest nutrient families known to scientists. More than 6,000 different flavonoids have been catalogued in research studies. Many of these flavonoids are found in the plants we eat and cook regularly, like vegetables, fruits, and herbs. With more researchers like Modern Canna Science (MCS) studying cannabis every day, new findings reveal the cannabis plant can also be a flavonoid-rich source, earning it a spot right up there with sweet potatoes or kale. Researchers are actively trying to distinguish cannaflavins, or marijuana flavonoids, from more common flavonoids. Case in point: it was recently discovered that cannabis flavonoid “cannaflavin-A” inhibits “PGE-2,” a prostaglandin responsible for inflammation and known for responding well to nonsteroidal, anti-inflammatory drugs (NSAIDs) like common aspirin. The study yielded that cannaflavin-A reduces swelling and is much more effective than aspirin. Cannflavin-B and cannflavin-C are subjects of ongoing studies as well, while scientists are still learning how more common flavonoids in cannabis like β-sitosterol, vitexin, isovitexin, apigenin, kaempferol, quercetin, luteolin, and orientin work together with, or resist, cannabis cannabinoids and terpenes. Many flavonoids have high antioxidant properties that encourage the body’s detoxing of harmful molecules. For this reason, flavonoid consumption is often—although not always—linked with a decreased cancer risk, most notably lung and breast cancer. Again, more flavonoid testing is needed on to determine their role in preventing these diseases. While the jury is still out on the overall health benefits of flavonoids in cannabis, this much we know for sure: in addition to their contribution to cannabis plant growth and our sensory experience, there are numerous advantages to be gained from their consumption. Centrally located in Lakeland, Florida, Modern Canna Science is capable of performing a wide range of analytical testing, including the analysis of cannabis flavonoid profiles. Laboratory technicians can also be dispatched to marijuana growing or processing facilities to ensure that standard operating procedures, records, and samples are all in compliance with Florida statutes and Department of Health regulations. For reliable, state-of-the-art marijuana flavonoid testing, call our lab to arrange a sample submission.